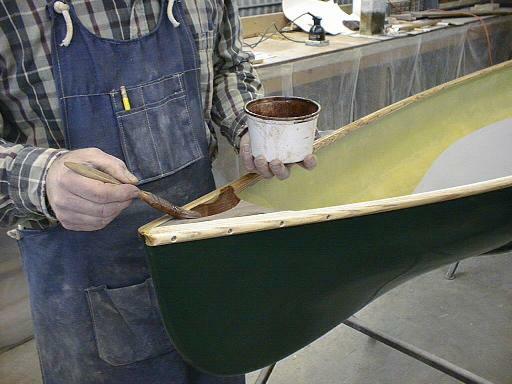 We construct Hemlock Canoe hulls using specially selected fabrics impregnated with a vinylester resin system, the characteristics of which are selected to match the durability and flexibility of the fabrics used. We use ﻿vinylester﻿ resins for the superior chemical bond they provide when combined with modern aerospace fabrics. Our exterior gel-coats are chosen for attractive appearance and durability and we carefully spray them to maintain proper thickness for optimum flexibility. Our experienced laminators lay up each hull by hand utilizing several full layers of cloth reinforced with additional partials (pieces) in areas of greatest stress according to the needs and uses of each individual design. We carefully cut each cloth partial to a predetermined pattern and place it to gain optimum strength. We use no mat, woven roving or foam fillers. The correct amount of resin us used to laminate the layers of cloth while keeping weight to a minimum. Finally we build contoured floatation tanks are built into the ends of each canoe. A composite canoe built in this way will have a very high strength to weight ratio. We feel this manner of canoe construction yields the highest quality hulls available consistent with durability, weight and price considerations. Such canoes have proven to be excellent long term investments. We construct our Premium+ hulls with an outer layer of high strength, military grade Structural Fiberglass (S2-glass) against the gel-coat. Several core layers and partials of Dupont Kevlar and an inner layer of a specially woven co-fab cloth consisting of an alternating weave of Kevlar and Carbon fiber. 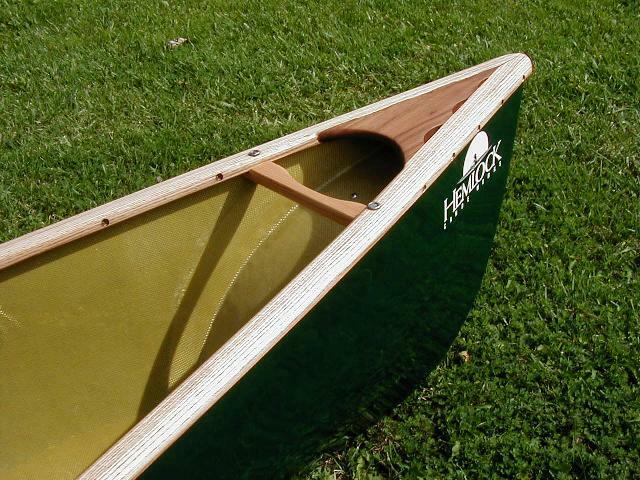 This hull construction is an improvement over an all Kevlar canoe as it offers better abrasion resistance, greater stiffness and more compressive strength. No foam cores or reinforcing ribs are used. The greater tensile strength inherent in this hull construction translates into increased tear and puncture resistance which should instill paddler trust for remote back country travel. Meticulously engineered for high performance and long durability, these canoes are a rewarding investment for the discerning paddler. 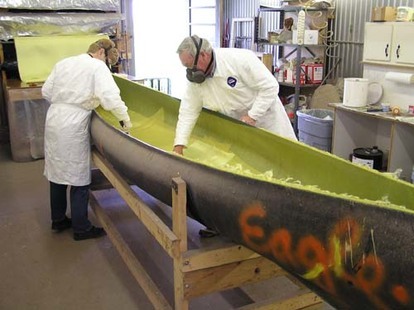 We construct our Kevlar/Hybrid hulls with a full outer layers of regular ﻿fiberglass canoe fabric (E-glass) ﻿against the gel-coat, core partials and full inner layers of Kevlar. No foam reinforcing cores or ribs are used. A scuff resistant painted interior patch is centered in the bottom with the rest of the interior left natural. We feel Kevlar reinforced canoes built in this manner give the best compromise between light weight, strength, durability and cost. In short, a superior hull for the appreciative paddler. Our Lite-Tech laminate used in the Shaman is a pigmented skin-coat exterior (no gel-coat) Premium+ hull, without flotation tanks. 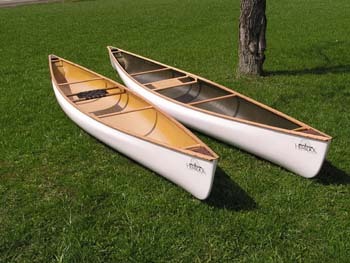 Customized individual rigging including flotation must be added before the canoe can be safely paddled. All fasteners are 18-8 stainless steel for strength and corrosion resistance. We impregnate all hardwood with several applications of a high quality marine wood preservative oil which penetrates deeply and protects the wood from the inside by polymerizing and becoming a resilient solid. It is not a surface coat that will be worn through, however periodic re-oiling will be necessary to maintain proper protection.